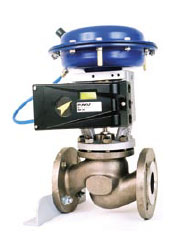 The D3 is ideal for applications where low air consumption is required on large volume actuators. It suits both linear and rotary actuators, single or double acting (with our withour spring return). The "split spindle" design allows special spindles to match most actuators to be fitted to a standard positioner. This reduces inventory costs and maintenace downtimes. We aim to keep a wide range of spindles in stock, which allows us to offer faster deliveries than many other Flowserve/PMV reselelrs. The D3 is very simple to inistall,use and operate due to a large graphic display and auto calibrate feature. It will drive the actuator to its open and close limits as well as calibrate its PID control settings to achieve presise valve control. Configuration via five large push bottoms is intuitive, reducing set up times . The computer-optimised pneumatic relay with piezo-electric valves offers excellent dynamic performance combined with low air consumption. The combination of these features result in lower energy consumption and considerable savings, while maintaining a high degree of valve performance. 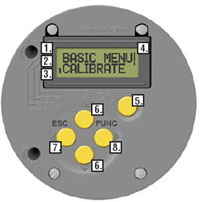 Communication via HART®, Profibus or Foundation Fieldbus is possible. 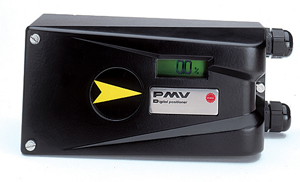 Optional plug in modules offers limit switches, alarm and feedback function. The strong, die-cast housing is treated with a powder epoxy, protecting the unit from corrosion and mechanical damage. Additionally, the uniquely designed strut on the cover protects the graphic display. The screw terminals for the electrical con-nection are located in an isolated and sealed housing to help protect the electronics if moisture should intrude the conduit. mounts on both rotary and linear actuators. Engineers at PMV have gone to great efforts in the de-sign of a simple, easy to understand UI- User Interface. A large graphic display and five keys make D3 simple to operate. All information is presented clearly in text form in the display. The display itself is visible with cover installed. The menu position indicator shows you how far you are in the menu structure. There are no LEDs, cryptic codes or other non-under-standable messages on the display. - no matter what kind of control valve is being used. ValveSight uses a dashboard-like interface that does not require the user to navigate alarms to understand the health of the device. It has been specially designed to communicate complex information simply and quickly. For more information please contact us. A simpler, lower cost version of the D3.